The moon Triton is, by far, the largest of Neptune's satellites. With a diameter of 1,681 miles, it is also the seventh largest in the solar system. In fact, it is so big, relative to the sizes of the planet's other 12 moons, that its mass represents 99.66% of the total 13. It orbits Neptune at a distance of 220,437 miles, taking five days and 21 hours to do so. This is in the opposite direction to Neptune's rotation, making it the only large moon in the solar system to display a retrograde orbit. As it always keeps the same face pointing at Neptune, one day on the moon Triton lasts the same as its year. 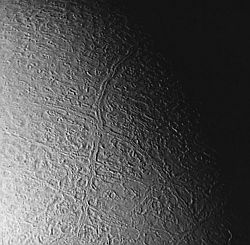 As you can see from this image, taken by NASA probe Voyager 2 in 1989, the surface of Triton falls into two distinct sections. The lower hemisphere seems to be mostly rough terrain, while a good fraction of the surface is the so-called "cantaloupe terrain", which is unique to this moon. Triton is essentially a flat moon, with elevations being no higher than one mile. Based solely on the observations of Voyager 2, which only managed to photograph 40% of the moon during its fly-by, this rocky terrain includes such features as ridges, troughs, plateaux and icy plains. 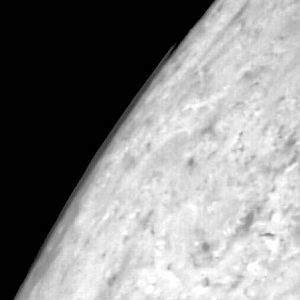 There is little evidence of cratering, suggesting that the surface of the moon Triton is relatively young. As you can see in this closeup of the moon's southern hemisphere, the surface appears very craggy. There are also black streaks dotted around, which are thought to be the fallout from geysers that eject ice. The fact that its surface is so young indicates the presence of considerable geological activity, generated by some internal heat source. The other type of surface is found on the moon's western hemisphere and is one of the strangest in the solar system. Indeed, it is not found on any other heavenly body. The features resemble the skin of a cantaloupe melon, which is where it gets its name. It is thought that this area is the oldest part of Triton. These strange depressions can be, on average, 20 miles across and have smooth sides. Although there have been several theories put forward regarding what they are and how they were formed, no-one knows for sure. The excessive geological activity points to Triton's interior being differentiated into a crust, mantle and core. The core is thought to comprise rock and metal. Over that is the mantle of water ice, covered with a crust of over 50% frozen nitrogen, with water ice and "dry ice" (frozen carbon dioxide) making up the rest. If the internally generated heat is sufficient to initiate convection within the mantle, there may be a vast subterranean ocean lurking beneath the moon's surface, which, theoretically, could harbour some sort of life. 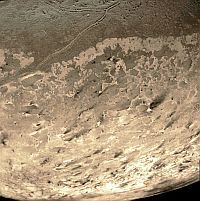 The moon Triton has been found to possess a very tenuous atmosphere, composed primarily of nitrogen that has evaporated from the surface. There's some carbon dioxide in there too and, at lower altitudes, traces of methane. In this image, you can just about make it out as a faint band. The lower section of this atmosphere is the troposphere, extending about five miles from the surface. This is where any weather systems would occur and the black streaks in the image further up the page suggest that Triton possesses a modest wind system. There are also examples of nitrogen condensing to form clouds. Extending above that to an altitude of 590 miles is the thermosphere, topped off by the exosphere. So, why is Triton the only large moon in the solar system to have a retrograde orbit? One thing is for sure: any object with such an orbit must have originated from a different part of the original solar nebula from which the solar system formed. 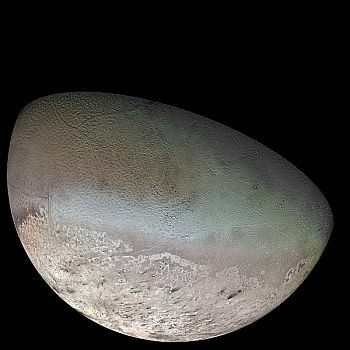 As Triton is only slightly larger than the dwarf planet Pluto and has almost identical composition, it is probable that the two objects originated from the same area. That area is thought to be the Kuiper Belt. The mechanism behind Triton's capture by Neptune is still a matter of conjecture, but the prevailing theory is this. Triton was originally paired with a much larger object, as a binary system. On encountering Neptune, the resulting interaction caused orbital energy to be transferred from Triton to the other object, slowing down Triton sufficiently to become bound to Neptune, whilst quickening up the other object, ejecting it back into deep space. Like many things in astronomy, it's still only a theory.